Special Stone made a mockery of the 22/1 odds she was sent off as when she romped home in the Korean Oaks at Busan in July. She’ll be much shorter than that as she bids to confirm her status as the year’s top three-year-old filly in the Gyeonggi Governor’s Cup (KOR over 1 1⁄8 m at Seoul Racecourse on Sunday. It was an impressive performance but back at her home track, can anything step up and end Special Stone’s winning streak at three? Top Busan trainer Kim Young-kwan arrives in the capital with two contenders. 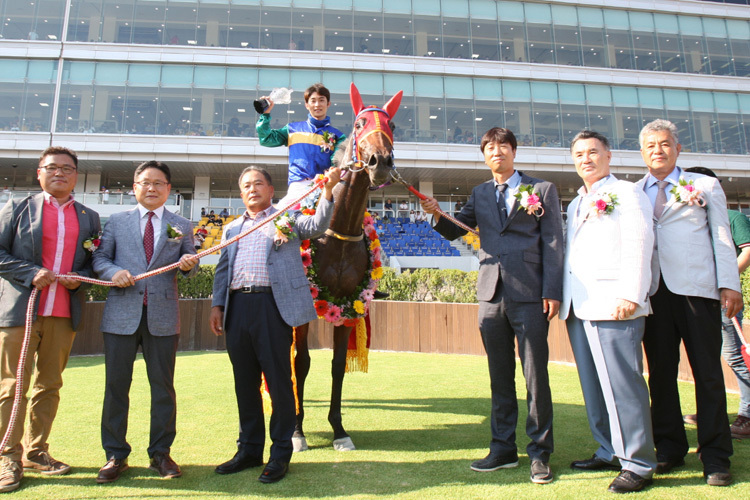 Blue Flag and Gyohaksangjang finished 4th and 5th in the Oaks and while Gyohaksangjang returns to action for the first time since then, Blue Flag has raced in the meantime and raced very well, leading all the way to win a class 3 handicap over 1 1⁄8 m by six-lengths. She is a “full” sister to 2014 Grand Prix Stakes winner Gyeongbudaero and still has a chance of turning out very nicely indeed. Busan’s champion jockey Jo In-kwen is in Seoul to ride her. The Gyeonggi Governor’s Cup is race 9 of an 11-race card at Seoul on Sunday with a post time of 4.45pm local Korea time.